Be the first to share your favorite memory, photo or story of Patricia "Trish". This memorial page is dedicated for family, friends and future generations to celebrate the life of their loved one. Patricia A. “Trish” Carter (nee McEnery), Born into Eternal Life on January 18, 2019. Beloved wife of John G. “Jack” Carter for 42 years. Loving mother of Kevin (Colleen), the late Colleen, Brian (Arielle), Brendan (Jessica), and Kathleen (Jake) Geary. Proud “Gammie” of Jack, Charlotte, Camden, Thomas, Charlie, Maeve, Henry, Grace, and Rowan. Beloved daughter of the late Jack and Peg McMahon McEnery. Dear sister of Kathleen (Terry) Shanahan, Lee Ellen (Reid Bennett) and the late Gene Schumacher, and Marita (John) Gocke. Fond sister-in-law of the late Linda Carter, the late Sharon Winquist-Horonzy, Maureen Carter, James (Patty) Carter, and Jerry Carter. 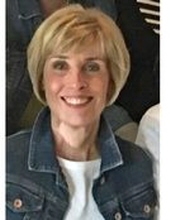 Trish was also dearly loved by nieces, nephews, cousins, teachers and students at Palos West, and countless friends. Alumna of Little Flower Grammar School and High School, and Saint Xavier University. Visitation Tuesday 3-8pm at Most Holy Redeemer Church, 96th St. & Lawndale Ave., Evergreen Park, IL 60805. Memorials to Most Holy Redeemer St. Vincent DePaul Society, 9525 S. Lawndale Ave., Evergreen Park, IL 60805 are most appreciated. To send flowers or a remembrance gift to the family of Patricia "Trish" A. Carter, please visit our Tribute Store. "Email Address" would like to share the life celebration of Patricia "Trish" A. Carter. Click on the "link" to go to share a favorite memory or leave a condolence message for the family.